A captivating true story that will speak to generations of Australians, from the author of Mezza Italiana. Leaving the small village of Fossa in Italy in 1939 to meet a father he barely remembered in a place that was far from everything he knew, fifteen-year-old Annibale Boccabella arrived in Australia determined to make a go of it. It was a time when everything was changing and anything seemed possible. Life was tough but you could still chase your dreams. More than 70 years later, in 2011, Zoe Boccabella and her family hurriedly try to save the treasured belongings of Annibale and his wife Francesca-Zoe's grandparents-from the rising waters of the Brisbane River. When Zoe sees the sign from their old fruit shop and milk bar about to disappear beneath the floodwater, this triggers in her a realisation that while she has long looked to Italy to discover her migrant heritage, much of it happened here in Australia. 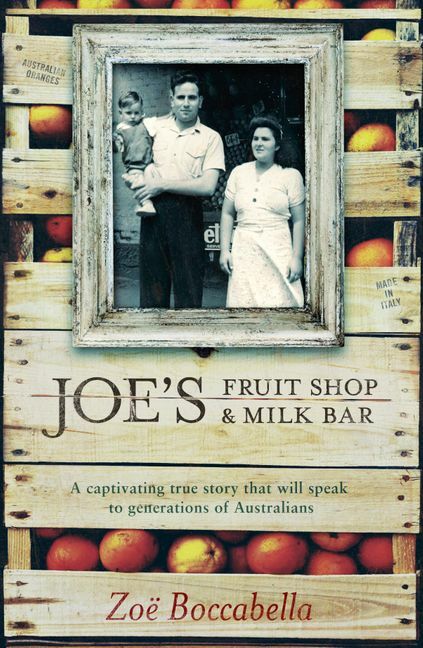 In Joe's Fruit Shop and Milk Bar, Zoe artfully weaves her own experiences with those of her grandparents, taking us on a journey from Abruzzo and Calabria in Italy to Australian sugar cane fields, internment camps, Greek cafes, and the fruit shop and milk bar that was the focus of a family's hopes and dreams for the future. With memorable, beautifully portrayed characters, evocative writing and a sweeping tale that reflects the experience of so many Australians, this is a story that will touch your heart and remind you of the important things in life.